Before Gertrude Stein became the twentieth century's preeminent experimental writer, she spent a decade conducting research in both the leading psychological laboratory and the leading medical school in the United States. 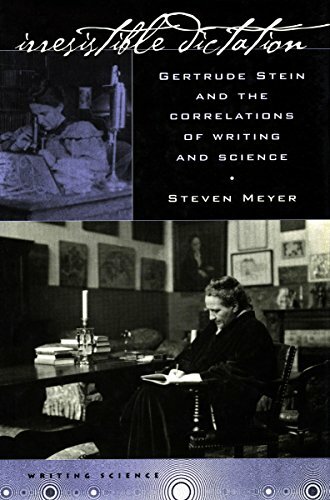 This book unearths the turn-of-the-century scientific and philosophical worlds in which the young Stein was immersed, demonstrating how her extensive scientific training continued to exert a profound influence on the development of her extraordinary literary practices. As an undergraduate, Stein worked with the philosopher William James and the psychologist Hugo M&uuml;nsterberg at the Harvard Psychological Laboratory, investigating secondary personalities and automatic writing. Later, at Johns Hopkins Medical School, she was involved in cutting-edge neuroanatomical research in the laboratory of Franklin Mall, the leading anatomist and embryologist of the day, and his assistant Lewellys Barker, the author of the first English-language textbook to describe the nervous system from the standpoint of the newly established neuron doctrine. Just as scientists reconceived relations among neurons as a function of contact or contiguity, rather than of organic connection, Stein radically reconceptualized language to place equal weight on the conjunctive and disjunctive relations among words. In the course of a broad reevaluation of Stein's career, the author situates this major postromantic thinker in the lineage of poet-scientists such as Wordsworth, Goethe, and Shelley, as well as in an important line of speculative thinkers that extends from Emerson to William James, Alfred North Whitehead, and Ludwig Wittgenstein, and emerges today in figures as disparate as the bioaesthetician Suzanne Langer, the technoscience theorist Donna Haraway, and the neuroscientists Francisco Varela, Gerald Edelman, and J. Allan Hobson. These two lines share the perspective that William James designated <i>radical empiricism</i>. A groundbreaking interdisciplinary study, <i>Irresistible Dictation</i> aims both to explicate Stein's radically experimental compositions and to bring the radical empiricist philosophical tradition into focus through the lens of her writing.